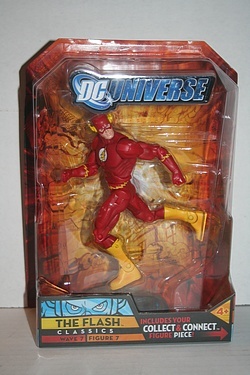 Turning our attention once again back to wave 7 of Mattel's DC Universe Classics figures, today let's take a look at The Flash! This wave marked the first time that the runaway success of this line allowed for 7 distinct figures to be included in a single wave. As such, since they don't need 7 parts for the build-a-figure, one of the figures gets the grand distinction of coming with only a boring figure stand! Well, The Flash was that figure in this wave - so click the image below for his bio, more pics and confirmation that he'll give you not an arm, not a leg, but a stand of dubious tipping.